Mike Shinoda went into detail about some of the themes explored on "Burn It Down", and how important it is for the listener to derive their own meanings from the lyrics, stating "You know, to be honest, we get the songs to a certain point, and once we put out our record, it's up to the fans to decide how the song gets finished. In other words, we lead you to a certain point in the road and we say, "Okay, the rest of it is your call. You bring your own interpretation to the song." In the case of most of these songs, I think Chester (Bennington) is coming from a certain place, I'm coming from my own experience, and on top of that, there are oftentimes metaphor and maybe a third read. In the case of "Burn it Down," we're talking about my personal story and his personal story, and there's also a layer of pop culture that plays a role in the lyrics of the song. For example, people build up a certain celebrity or musician or actor or whatever and they're popular one minute and the next thing, you know either they've done something wrong or they've done nothing wrong and there's just a bad rumor that goes around about them and then everybody's attacking that person. That's just the way things are. We've actually lived through that as a band. All that stuff plays a role." 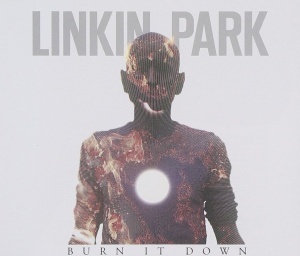 "Burn It Down", by far, has gotten the most remixes compared to any other song from Living Things, and most songs in Linkin Park's discography, with a grand total of 12 remixes. The song had one remix released on the band's second remix album, Recharged, done by Tom Swoon, in addition to a remix done by Paul Van Dyk, which was included as a pre-order bonus for the remix album. To promote the album, Paul Van Dyk and Mike Shinoda held a chat with fans on Twitter. During the chat, Mike said he has never met Paul Van Dyk in person and Paul said his favorite part about working on the remix was "taking this fantastic track to the dance floor!". The track also had four remixes released as a part of the Living Things Remix Subscription, which was a reward for pre-ordering Living Things. In addition to the remixes by Tom Swoon and Paul Van Dyk, remixes done by RAC and Bobina were included in the subscription. The Bobina remix was actually a fan made remix given away for free download after his Facebook profile reached 50000 fans. The band liked the remix so much that they decided to present it to fans along with the Rad Omen remix of "Roads Untraveled". A month before, Mike had been asking for good fan remixes of Living Things songs on Twitter. Even more remixes for the song were released as a part of the Burn It Down Remixes promo CD, which included the aforementioned remixes, barring Tom Swoon's, and included remixes by Hann With Gunn, Double Dust, Heavy Burn, Arya Shani, and John Reaper. A few of those remixes were also fan made and were previously released by the artists themselves. The Hann With Gunn remix was given to Linkin Park on a meet and greet during their European Tour in 2012. When Arya Shani's remix was released, he was only 13 years old. The CD also included two more versions of Paul Van Dyk's remix, both of which cut Mike's rap, but one was considered a "radio edit", which cut the length of the remix in half. Finally, over three years after the song was released, one final remix of "Burn It Down" was released, done by Charly Beck. It wasn't included on any official releases from the band, but was later released digitally with the consent of Linkin Park's label, Warner Bros. Records. According to Martin von Auen, who worked as producer on Beck's remix, it took eight weeks until they heard back from Linkin Park. A few other remixes of the song were said to have been done, but remain unreleased. Mike Shinoda said that he would do a remix for the track, but it was never released. In addition, Tech N9ne recorded a verse for a "Burn It Down" remix, but the track was never released. Linkin Park announced on May 31, 2012 they had teamed with Genero.tv for a "Burn It Down" music video contest. The band provided a download of the full performance video for the song and contestants were allowed to use as much or as little of the original video as they'd like, the only condition being to be creative and make the video their own. The contest ended on July 6 and the winner, chosen by Linkin Park, Warner Bros Records and Genero, received $5,000 and had their video premiered on MTV globally. The big prize winner was Jem Garrard (aka Jemga), a Canada-based filmmaker from London, England. She wrote, "Thanks for checking it out. Alex is a great little actor and very fun to work with. The story was written especially for the song, and of course in competitions such as this, multiple ideas and visions will be screened. That's the beauty of it, so many creative videos to look at! I took a less literal approach with this. The idea of 'burning down' to me didn't represent fire, but the idea of creating and destroying icons in the media. So I thought it would be fun to take a futuristic look at that, and use the idea of a robot game show! Thanks again for your comments and taking the time. I'm very lucky to work with the people I do, and it was great to incorporate 3D into a video. I enjoyed the process." Listed on Burn It Down Remixes as "Burn It Down (Main)". Released as part of the Living Things Remix Subscription on January 6, 2012. Released as part of the Living Things Remix Subscription on August 7, 2012. Listed on Recharged as "Burn It Down (Tom Swoon Remix)". Released for free download on Bobina's official SoundCloud page on September 13, 2012. Given away after his Facebook profile reached 50000 fans. Later released by Linkin Park as part of the Living Things Remix Subscription along with "Roads Untraveled (Rad Omen Remix feat. Bun B)" on October 1, 2012. Remix by Paul Van Dyk. Released as part of the Living Things Remix Subscription on July 7, 2012. Used in the alternative "Burn It Down" music video for the remix. Remix by Hann With Gun. Released on PromoDJ.com for free download on June 22, 2012. Remix by Johsian Vazquez and Johvan Vazquez. Uploaded to Double Dust's official YouTube channel on May 8, 2012. Uploaded to Arya Shani's official SoundCloud account on July 2, 2012. Produced by Martin Von Auen. Speech after the song recorded in Birmingham on July 6, 2017. "Burn It Down" got its live debut during the band's KROQ Dressing Room rehearsal, from which point onwards, it was a staple in the band's live set. It was played at every full show, and most shortened and award shows, throughout the Living Things cycle. During the band's European festival run in 2012, "Burn It Down" was used to open the encore at headlining shows, and followed "The Catalyst" at the festival shows. It was the only full song to be played during the band's short run in Japan following the European tour, and was performed twice when the band performed on Jimmy Kimmel Live. The position of "Burn It Down" in the sets for Honda Civic Tour's setlists was very similar to its positions during the European tour, opening the encore in Set A, following "Numb", and later "What I've Done", in Set B, and being played after "The Catalyst", and later "What I've Done", in Set C. The sets for 2013 kept "Burn It Down" in the same position, except it didn't open the encore in festival Set A, since that set didn't have an encore. Instead, it was played after "What I've Done". 2014 kept things pretty simple for "Burn It Down" at first. During the short, three show run the band went on in January, "Burn It Down" was played after "In The End" for the private launch show for Harman Infinity One and the Concert for the Philippines benefit show, and was played after "What I've Done" for the headlining show. Despite the experimental start to The Hunting Party touring cycle, "Burn It Down" was one of the few songs that wasn't shortened or given a new intro or outro. The standard, studio version was played after "Joe Solo" until Set B of the Carnivores Tour debuted, where it was shortened to exclude the first chorus and second verse, as well as given a new, short extended intro, since it opened the encore. These sets were played at every full show for the rest of 2014. At the band's first show in Brazil for The Hunting Party cycle, "Burn It Down" was plagued with technical difficulties, including the opening synth being played in the wrong key, the wrong synth playing during the verse and chorus, and Mike forgetting to start his rap bridge, so Chester started singing the second verse. Right as Chester began, though, Mike started the rap. At the 12th LPU Summit in Amsterdam, a new version of "Burn It Down" was played with a different beat dubbed the "Reggae Version". "Burn It Down" was played second at both Live 105's Not So Silent Night and KROQ Almost Acoustic Christmas 2014, right after "Joe Solo". For a private show at LP Underground HQ, "Burn It Down" was played acoustically for the first time, alongside "LOATR/SOTD/Iridescent" and "Final Masquerade". The two sets for the 2015 North American tour had "Burn It Down" in the same positions as the sets for Carnivores Tour. At Rock In Rio USA, "Burn It Down" was played after "New Divide" in the shortened, new set. The full version of this set had "Burn It Down" coming out of a shortened form of "Darker Than Blood", which featured only the first verse and chorus acapella over a droning synth. On February 16, 2017, Linkin Park performed a stripped down version of "Burn It Down" for a Facebook live stream. This version featured Mike on piano and vocals, Brad on guitar, and Chester and Kiiara on vocals. For the first time, Mike sang his verse on the bridge instead of singing it. The reggae version of the song made its return later that month at a private filming for the 50th anniversary of Mercedes-AMG. Mike and Chester continued to perform the stripped down version of "Burn It Down" during the European promo shows in March 2017, but performed it as a piano version as Brad was not present to play guitar. The full band version of the song returned once the One More Light World Tour started, being performed far earlier in the set than the song had ever been played at a full show, following "Talking To Myself". M. Shadows from Avenged Sevenfold joined the band for the song at the memorial show for Chester Bennington. "Burn It Down" was released in 2012 as part of a DLC for the 2010 videogame Rock Band 3. "Burn It Down" is featured in the 2012 videogame Linkin Park GP. "Burn It Down" was featured in the promo teaser for the 2012 NBA Playoffs. A remix of "Burn It Down" by Bobina was featured in the 2013 NBA Playoffs.